هدف اصلی از اجرای این پژوهش آشنایی با کارکردهای گوناگون انجمنهای علمی دانشجویی دانشگاه اصفهان در پنج حیطه‌ علمی، پژوهشی، نشر و مدیریت دانش، جامعه‌پذیری و کارآفرینی است. هدف دیگر این پژوهش مقایسه‌ کارکرد انجمنهای علمی دانشجویی رشته‌های علوم و مهندسی با سایر رشته‌هاست. جامعه آماری این پژوهش شامل اعضای فعال، اعضای هیئت مدیره انجمنهای علمی دانشجویی و نیز معاونت فرهنگی دانشجویی دانشگاه اصفهان بودند. نمونه آماری را تعداد 80 نفر از اعضای فعال انجمنها و 15 نفر از مدیران تشکیل می‌دادند. پژوهش به دو روش کمّی و کیفی انجام شده است. در پژوهش کمّی، پرسشنامه ‌هایی با سؤالهای پنج گزینه‌ای طیف لیکرت تنظیم و به نمونه‌ای از دانشجویان منتخب داده شد. مشاهده و مصاحبه نیز از جمله ابزارهای کیفی جمع‌آوری اطلاعات بود. نتایج پژوهش نشان داد که انجمنهای علمی دانشجویی کارکردهای مثبتی را در ابعاد گوناگون علمی، پژوهشی، نشر و مدیریت دانش، جامعه‌پذیری و کارآفرینی برای اعضا به‌همراه داشته است. 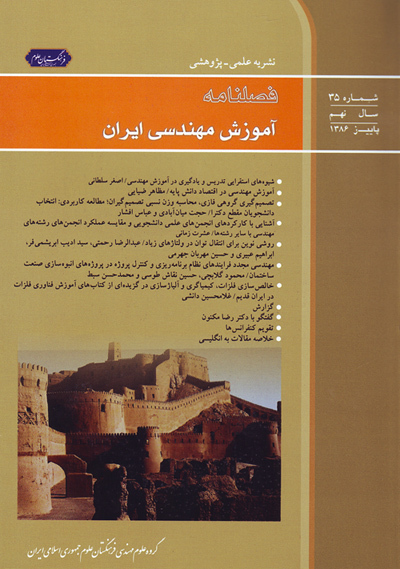 در بعد جامعه‌پذیری و پرورش مهارتهای اجتماعی این نقش برجسته‌تر است. از سوی دیگر، آمار و ارقام ثبت شده در اسناد و مدارک تفاوت بارزی را بین فعالیتهای علمی و پژوهشی انجمنهای فنی و مهندسی با سایر انجمنها نشان می‌دهد. در صورتی‌که یافته‌های پژوهش حاضر نشان می‌دهد که از نظر کارکرد ها تفاوت معناداری میان اعضای انجمنهای علمی¬دانشجویی رشته‌‌‌‌های فنی مهندسی و علوم با سایر رشته‌های دانشگاهی دانشگاه اصفهان وجود ندارد. یافته-‌های این پژوهش می ‌تواند برای مسئولان آموزش عالی کشور، دانشگا‌هها، انجمنهای علمی و کانونهای فرهنگی مورد استفاده قرار گیرد. The main purpose of this study is to be acquainted with the various functions of the student scientific associations at Isfahan University in different activities such as academic, research, publishing, socialization and entrepreneurship. The second objective is to compare the functions of engineering's scientific associations with other disciplines. Participants in this study were members and administrators of cultural and scientific associations of Isfahan University. Samples included 80 active students who were randomly selected and 15 interested managers for interviewing. Both quantitative and qualitative methods were used for collecting data. For quantitative data, questionnaires were based on Likert's scale and had five options. The questionnaires were given to the sample of selected students. Interviews, observations and archive documents were other instruments for gathering qualitative data. Findings of the research indicate that the cultural and scientific associations in the University of Isfahan had positive functions in various domains: academic, research, publishing, socialization and entrepreneurship. This role was more important in the socialization and social skills training. On the other hand, data in the recorded documents indicate that there was a big difference between functions of engineering's scientific associations with other disciplines in the light of academic and research functions. But, findings of the present study indicate that there was no meaningful difference between different functions of scientific associations in engineering and science with other disciplines in Isfahan University. Based upon the results, recommendations were provided for the Isfahan administrators, scientific associations' leaders and whom it may concern.